Original article by Emily Laber-Warren, “Calling a Truce in the Political Wars”. Featured in Scientific American Mind, Sept. 2012. Psychologically, Republicans and Democrats are different. This isn’t just my opinion, but there are actual studies that show how liberals and conservatives are different in their personalities and even their unconscious reactions to the world around them. In a 2008 study, examining the contents of 76 college students’ bedrooms, it was revealed that conservatives possessed more cleaning and organizational items such as ironing boards and calendars, confirming that they are orderly and self-disciplined. Liberals owned more books and travel-related memorabilia, which conforms with previous research suggesting that they are open and novelty-seeking. In a 2009 study, 8,000 people with a series of hypothetical actions. Among them: kick a dog in the head; discard a box of ballots to help your candidate win; publicly bet against a favorite sports team; and receive a blood transfusion from a child molester. Participants had to say whether they would do these deeds for money and, if so, for how much – $10? $1,000? $100,000? More? Liberals were reluctant to harm a living thing or act unfairly, even for $1 million, but they were willing to betray group loyalty and disrespect authority. Conservatives said they were less willing to compromise on any of the moral categories. In a 2009 study, when viewing a collage of photographs, conservatives’ eyes unconsciously lingered 15 percent longer on repellent images, such as car wrecks – suggesting that conservatives are more attuned than liberals to assessing potential threats. Well this is all very interesting, but is there a point? According to psychologist Jonathan Haidt, liberals and conservatives are equally grounded in ethics. Liberals should acknowledge that the Right’s emphasis on laws, institutions, customs and religion is valuable. Conservatives recognize that democracy is a huge achievement and that maintaining the social order requires imposing constraints on people. Liberal values, on the other hand, also serve important roles: ensuring that the rights of weaker members of society are respected; limiting the harmful effects, such as pollution, that corporations sometimes pass on to others; and fostering innovation by supporting diverse ideas and ways of life. 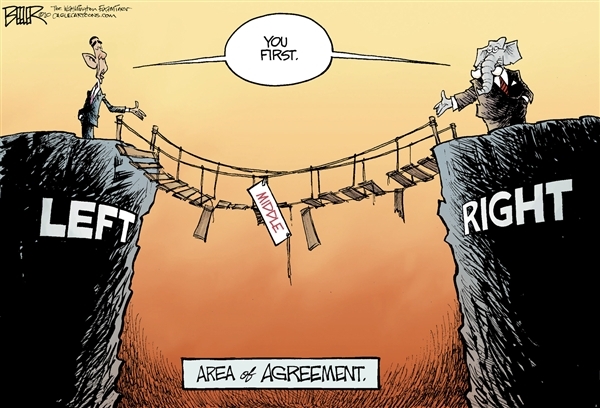 Congress is in a perpetual stalemate because of the parties’ inability to find middle ground on practically anything. 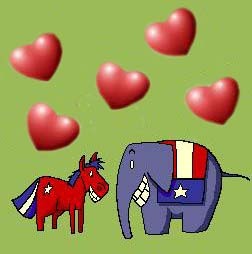 Although conservatives and liberals are fundamentally different, hints are emerging about how to help them coexist. Even if their views clash, they are equally grounded in ethics. Haidt is not out to change people’s deepest moral beliefs. Yet he thinks that if people could see that those they disagree with are not immoral but simply emphasizing different moral principles, some of the antagonism would subside. To learn more, check out Haidt’s The Righteous Mind – Why Good People are Divided by Politics and Religions.